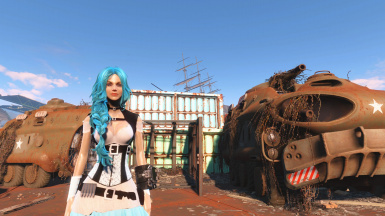 This mod adds two modular sets of armours to Fallout 4, inspired by Steampunk clothing. The bags and bullets on the belt and the aviator cap are vanilla meshes. You cannot port them to any other game as Bethesda doesn't allow it. 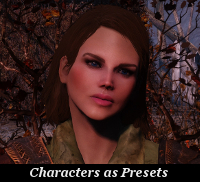 The rest of items are my own creation and you can reuse any part of them into your own mod but all I ask in return is that you give me credit if you distribute any part of this mod and only if it is for free. If you want, once you've relased your mod, you can send me a link and I'll add it to the description tab of this mod. You can not use my assets in any mods/files that are being sold, for money, on Steam Workshop or other platforms. Thanks to Bethesda for creating Fallout 4. Thanks to Caliente for the CBBE body. Thanks to Ousnius for the Material Editor and for BodySlide and Outfit Studio, and all the help given, and for fixing the bodyslide data for the Vest under armours. Thanks to Tumbajamba, Astralify and Jonathan Ostrus for the tutorials on how to make things work in Fallout 4. Thanks to Brigand231 for making it BodySlide compatible. Thanks to all the modding community for all their tutorials, tools and help. Especially, thanks to the TES Adventures, Clan Dlan, Bethesda Official Forum and the Nexus communities. 15-08-2016 - Enchantment of each item is displayed when crafting it. See pictures for reference. 28-08-2016 - None of the items has any enchantment. Obviuously there are no Night Vision goggles in this version (no enchantments, remember? XD). Requires main file, replace the esp file in the main file with this one. 13-08-2016 - Added an optional file that makes the items BodySlide compatible. Made by Brigand 231. 13-08-2016 - Added an optional file containing the BodySlide preset I used for making this armour. 13-08-2016 - Added an optional file with the version of the mod for the vanilla body. 14-08-2016 - Fixed the wrist seams for the vanilla version. 14-08-2016 - Updated Bodyslide files for the base outfit. Skirt physics are still broken. 14-08-2016 - Uploaded GIMP files and UV maps under the "Miscellaneous" section. 15-08-2016 - Uploaded the Blender file with the Steampunk skirt and the Irma skirt. It is a Blender 2.75 file. 15-08-2016 - Updated Bodyslide files to v3. Fixed the skirt physics in Bodyslide. Now all items should work in Bodyslide. 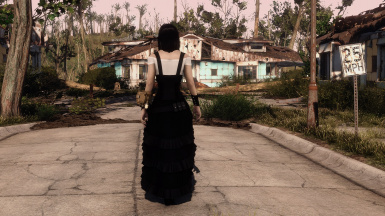 This mod adds two modular sets of armours to Fallout 4, inspired by Steampunk clothing. 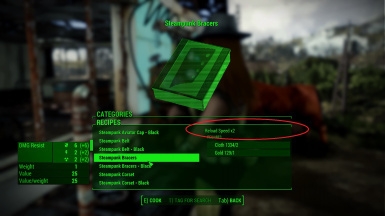 The body slot usage follows the community standard explained here: Body Slots usage for Fallout 4 - Nexus Wiki, to make it as compatible as possible with other modular mods. All items come in two versions, the standard version and a black one. You can mix the items of both sets. 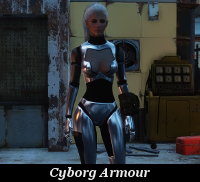 All items allow the Ballistic Weave mod and the lining mods of both the VaultSuit and the Vault armours. To obtain the items craft them in the Chemistry lab, under the Utility category. * Slot = 36-Underarmour torso. * Slot = 44-Armour left leg. * Slot = 45-Armour right leg. * Slot = 37 - Underarmour left arm. * Slot = 40 - Underarmour right leg. * Slot = 39 - Underarmour left leg. There is a version of the mod in which the items have non enchantment at all. That version doesn't have the night vision goggles (no enchantments, remeber? XD) and you can find it under the optional files section. * The default female body used for the armour is a (slightly modified Curvy CBBE body). * There is an optional file, made by Brigand 231, that makes the items BodySlide compatible. * There is also an optional file with the version for the vanilla body. 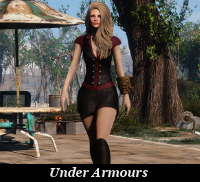 * rpuresteel has also converted this mod to work with the Atomic Beauty body Ashara FO4 Steampunk Lady for Atomic Beauty. Edit your Fallout4Custom.ini file, which is usually located at your (documents folder)\My Games\Fallout4\ folder. Edit your Fallout4Prefs.ini, which is at the same location than the other ini file. 2. Select the file in the Mods tab of NMM, and click on the "Installs and/or enables the selected mod" button. When asked if you want to overwrite existing files say "Yes to all". 3. 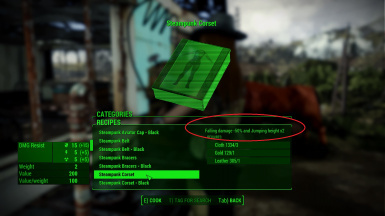 Open plugins.txt (located in C:\Users\-username-\AppData\Fallout4) and add AsharaFO4Steampunk.esp to the list. 1. Select the file in the Mods tab of NMM, and click on the "Disables the selected mod" button. Anone that I am aware of. If you find anything, please tell me. * WolfGrimDark's awesome ENB and Reshade preset Grim Wolf Institute ASD. 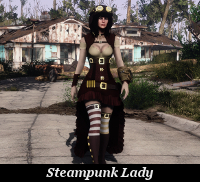 * rpuresteel's Ashara FO4 Steampunk Lady for Atomic Beauty. It converts the items of this mod to the Atomic Beauty body. * Elianora's Steampunk Gunslinger Outfit CBBE. It uses some of the items from this mod. * alexjet85's Elianora's Steampunk Gunslinger Outfit - Bodyslide. Bodyslide files for Elianora's mashup. * DWooT's Doc Weathers Caravan. It uses some of the items from this mod. * AWARHERO and DWooT's AWARHERO's Diamond City The Great Green Jewel. It uses some of the items from this mod. * drmwayne's Gothic Lady Dresses and Accesoires - CBBE - BodySlide - AWKCR. It uses some items from this mod. * NiTeNull's Shade Girl Leather Outfits - CBBE. It uses some items from this mod. You can contact me leaving a comment at the file's thread or sending me a PM. You can find me on the Bethesda official forums as Ashara: https://community.bethesda.net/people/ashara. 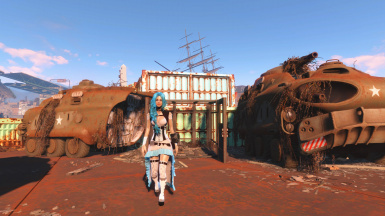 * Material Editor - http://www.nexusmods.com/fallout4/mods/3635/?